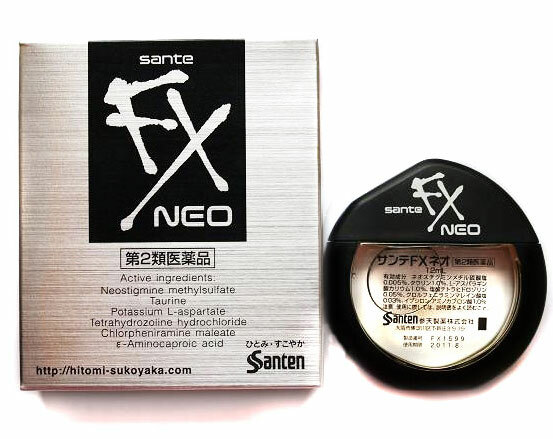 Product features Eyes are tired from the PCs which do not fit it which the letter of a newspaper and the documents which a thing nearby is hard to watch is veiled and is hard to read, and ... "smile 40EX" acts for various symptoms such as "haze "eyestrain" "itch" "hyperemia" of eyes" beginning with age by triple vitamins prescription of vitamin A, E, B6 which gives the cell of eyes direct nourishment effectively recently. 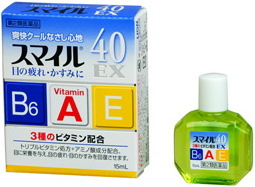 The important vitamins that vitamin A is indispensable to maintain the healthy function of eyes. 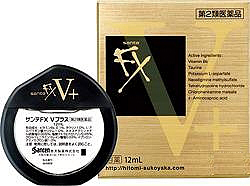 Even if sensitivity "for the" light decreases, I am told that vitamin A lacks. 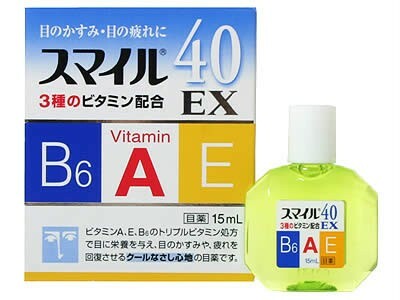 30000 credits (in 100mL) combine this vitamin A with smile 40EX. Action to keep moisture at action, eyes regenerating a cornea cell of vitamin A acts for a "nebula" "eyestrain" effectively. 2. 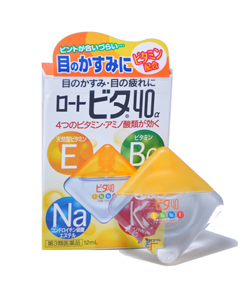 Triple vitamins prescription to work for a "nebula" "eyestrain"
I combine L-potassium aspartate promoting an antioxidant action, natural model vitamin E having anti-inflammatory action, blood circulation promotion action, vitamin B6 doing the tissue respiration of eyes lively, three kinds of vitamins of vitamin A, methyl sulfuric acid neostigmine, metabolism to improve the decline of the focus adjustment function more. I improve haze, the eyestrain of eyes from various angles. 3. It is effective for "itch" "hyperemia"
I improve unpleasant symptoms such as an itch, hyperemia of eyes by antihistaminic action of the maleate chlorpheniramine, antihyperemia action of tetrahydrozoline hydrochloride. Relax tense nerve; is stimulating; shine, and is a feeling. (1) who are receiving medical attention. (2) The person or family who have allergies. (3) People who have had allergic reactions caused by drugs. (4) persons with the following symptoms. (5) The following persons were diagnosed. (1) After use, the following symptoms may occur. 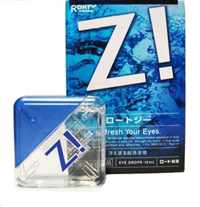 Dosage 3 to 6 times one, please drop eye drops 1-3 times. Usage-related care (1) excessive use, or feel a glare unusual congestion may lead to the contrary. (2) When I let an infant use it, let me use it with the instruction supervision of the protector. 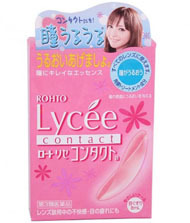 (4) Please do not use it with attaching a soft contact lens. (5) Please use it only for dropping lotion in the eyes. Component quantity In 100mL ?? Cautions for storage and handling (1) Please keep it sealed in a cool place avoiding direct sunlight. (2) Please keep it out of reach of infants. (4) Please do not share it with others. (5) The expiry date (Read the bottom of the carton) Please do not use the product too. Consumer Counseling A company name: Lion Co., Ltd. Hours: 9:00 to 17:00 (Saturdays, Sundays, excluding holidays). Manufacturing and sales companies Lion Corp.
A company name: Lion Co., Ltd.